A "Full Update/Upload" is the initial upload of your product data in which the content data such as the supplier's images, titles, descriptions, categories, and more are uploaded to your sales channel. 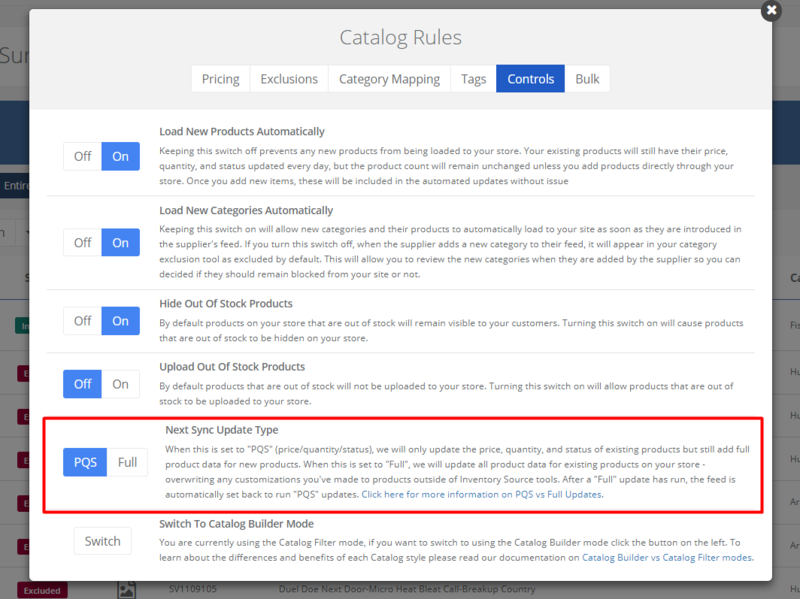 This process is typically only run once in the lifetime of a product as after the product data has been uploaded once, that product then switches to the "price/quantity/status update" process noted below. A full update will be required if you re-assign or rename categories in the Category Mapping tool after the first initial update. Notes: In the case of uploading to marketplaces that house their own content data, such as Amazon, the full update process is simply matching the UPC from the supplier with the Marketplace listing's existing content data. There is no actual "upload" of images, titles, etc. and can not be edited in the Inventory Source product customization tool. During your daily PQS updates, we update the price, quantity, and status of your products. Users will receive at least two updates per 24 hours.Users on our Pro and Enterprise plans are set up on optimized syncing, meaning they will receive updates as frequently as the supplier updates their inventory (that can sometimes be up to 12x per day)- this allows users to have the most up-to-date inventory details as possible. 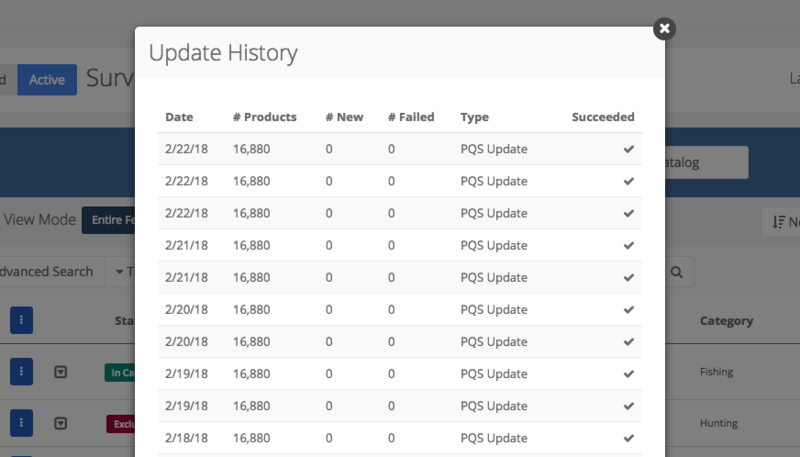 The PQS on-demand update is typically used in cases where you have made a recent change to your price or filter settings and want to push the update to your store. All users are allotted at least one on-demand update per 24 hours, however users on our upgraded plans have the option to run on-demand updates 4x or more. You will receive an email after each PQS update completes, to confirm the number of products that were updated successfully and occasionally any products that failed to update. If you do see any product update failures, feel free to reach out to our support team for additional information. You can view the time and date of your most recent update for each of your integrations in your Catalog Manager. You can also view your update history by clicking the bar graph icon on the right-hand side of your Catalog Manager.